Given his government’s contentious approach to copyright reform, one might expect Stephen Harper to closely follow the letter of existing intellectual property law while on campaign. One mischief maker contacted Talking Points to suggest that Harper’s performance of John Lennon’s Imagine at a campaign stop in Winnipeg might have breached the copyright on the 1971 song. On Tuesday, Harper sat down at the keyboard with ten-year-old Maria Aragon, famed for her YouTube rendition of a Lady Gaga song. 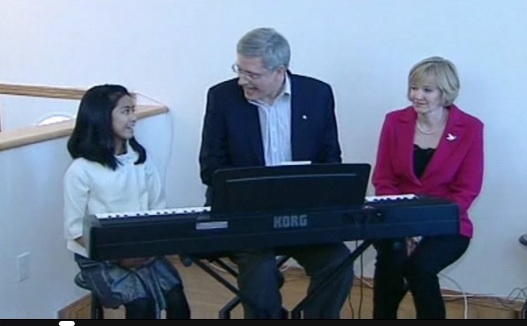 The Tories posted video of Harper warbling out Imagine on their website. Should Harper should have to pay a royalty for use of the song and — for bonus points — declare it as a campaign expense? Bars and restaurants that don’t pony up for the tariff fees on the tunes are regularly hauled into Federal Court by the Society of Composers, Authors and Music Publishers of Canada (SOCAN). But SOCAN says that, in this case, Harper’s in the clear. Had he sung in a bar or restaurant, it might have been a different story. Also, there is no SOCAN tariff applicable to works posted on the Internet. But still uncertain is whether Harper would be vulnerable to legal action by the Lennon estate, should Yoko Ono take exception to the use of the song to promote a conservative politician.